Who could possibly resist cookies with this name? (Oh, wait, now that I think about it…). Recently, I was browsing the Cooking Channel website, and Elvis Cookies popped up. I was intrigued by the combination of chocolate, bananas and ten slices of bacon and briefly considered making them (and I’m such a sucker for attention that I’m sure I will make them if even one person asks me to). However, I spied “I Want to Marry You” Cookies at the bottom of my screen, and they seemed to hold more promise. For starters, they are made on the stove-top and do not require dirtying my beloved Kitchen Aid mixer, so they appealed to my lazy side. Secondly, they won some sort of contest, and despite the fact the author of this winning recipe looks like she never ate a cookie in her whole entire life, it is exactly the kind of hype to which I’m powerless. Want to impress me? Just tell me you won a contest. I LOVE WINNERS! I followed the directions exactly, and the cooking time wasn’t really adequate. I question whether 325 degrees is really the best temperature for these, and I may turn the oven up to 350 next time I bake them. My oven is very well calibrated, and there is no reason they should have been so gushy after 14 minutes. They took me close to 19 minutes. However, the end result was quite good, and I’m still amazed that they were created in a saucepan with relatively little mess. 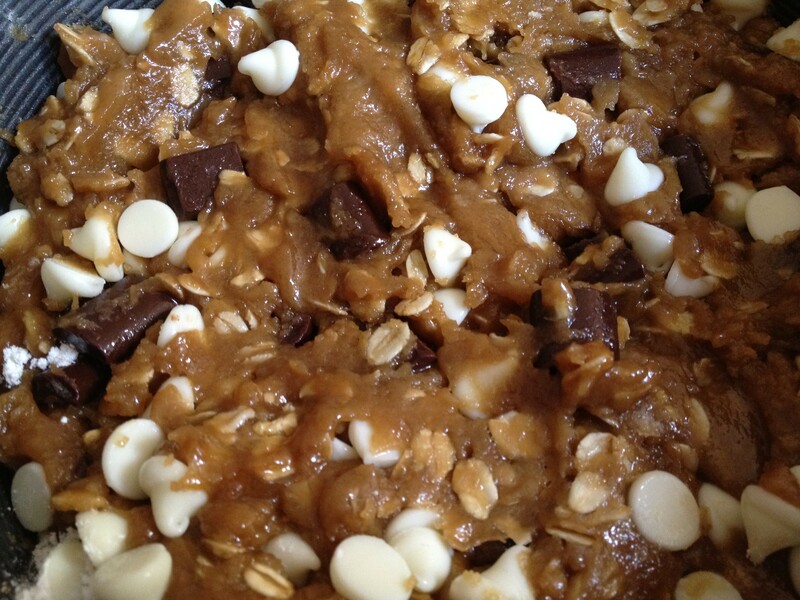 I will definitely be making these again, and next time I may ditch the white chocolate chips in favor of peanut butter. I may also brown the butter (similar to the Perfect Cookie recipe I posted here). The flavor is good, the texture is chewy yet firm, and I declare it a winner. In a medium saucepan, melt the butter over medium heat until melted. Remove from the heat. Add the dark brown sugar and granulated sugar and stir until sugars are incorporated and smooth. Chill the mixture for 10 minutes. Stir in the white chocolate chips and chocolate chips. Roll by hand into 24 medium-size balls or use a scoop, and place on a light-colored cookie sheet. 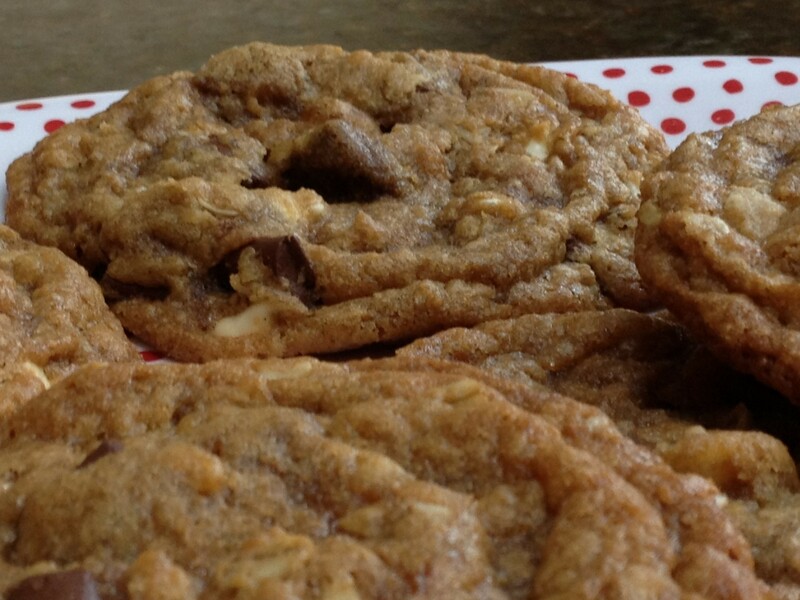 Preheat the oven to 325 degrees F. Remove the cookies from the refrigerator and bake for 12 to 14 minutes. My favorite part of this recipe — only one pan to dirty. 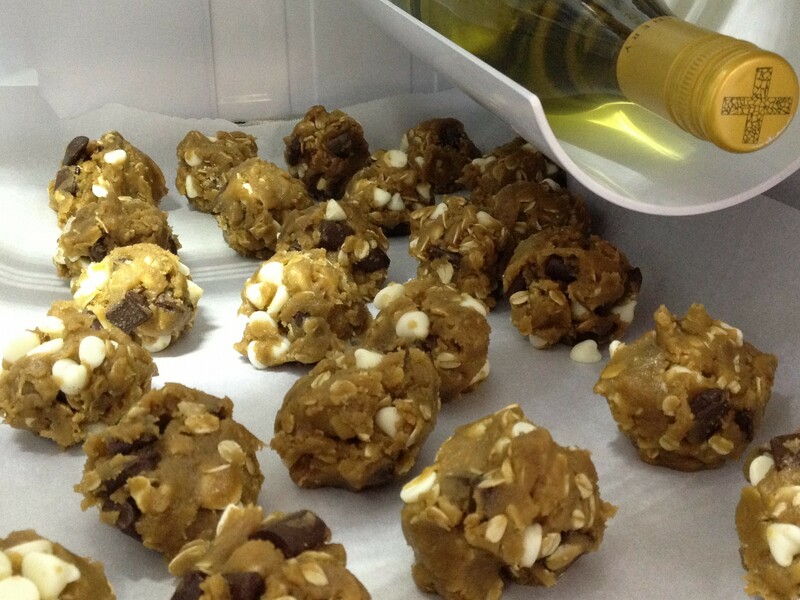 Make sure your cookies are well chilled in the refrigerator before baking. Wine not included. Beware of marriage proposals when sharing! This entry was posted in Desserts and tagged "I want to marry you" cookies, chocolate chip oatmeal cookies, stove top cookies by Mom Mom's Apron. Bookmark the permalink. I think I’m in love. These look delicious! Thanks! They were really good. And I managed to freeze five unbaked ones for emergency dessert. They are yummy! I managed to freeze half but that is because everyone was gone while I was baking and didn’t eat them as fast as I made them. I’m going to attempt to make these tonight, they sound amazing. Oatmeal, chocolate chips & peanut butter. I’m sold! Two questions: #1, By peanut butter you mean, substituting with peanut butter chips vs. white chocolate chips? #2 Rolled oats; old fashioned or quick cooking? Thanks for the clarification! I made them and they looked like your pictures above, (prior to baking) but did not come out beautifully thin and chewy like your post-baked pix. They seemed pale and gooey at the 14 minute mark so I pushed the cook time and ended up overbaking them. I need to learn to trust the prescribed cooking times. I have a ‘better to be over done than under done ‘ philosophy in all aspects of my cooking & baking that I need to break free from (my husband would be nodding in agreement with this admission)! But, the taste was still amazing and with a little milk for dunking, we managed to devour them by the end of the weekend! Next time I will stick with the bake time outlined above. I really love your blog and all of the recipes sound wonderful! Next challenge, Cinnamon Bun Popcorn for Friday night movie night with the kiddos & Chicken Corn Chowder for Sunday afternoon. So sorry to hear you had some trouble. I agree that the cooking time seemed “off” and my cookies definitely needed a few more minutes as I mentioned in my original post. Also, when I cooked my frozen batch, I raised the temp to 350 F and that seemed to work better. You do have to watch them carefully, though — underdone to overcooked happens in a flash! However, I definitely would have had a mushy mess if I took them out at 14 minutes, so your instincts were probably correct in giving them more time. just to see if other people reported problems with the time/temp, and no one did. Surprising! Anyway, sorry they weren’t quite perfect. If/when I make them again, I will try to modify my instructions accordingly and let you know what works best.